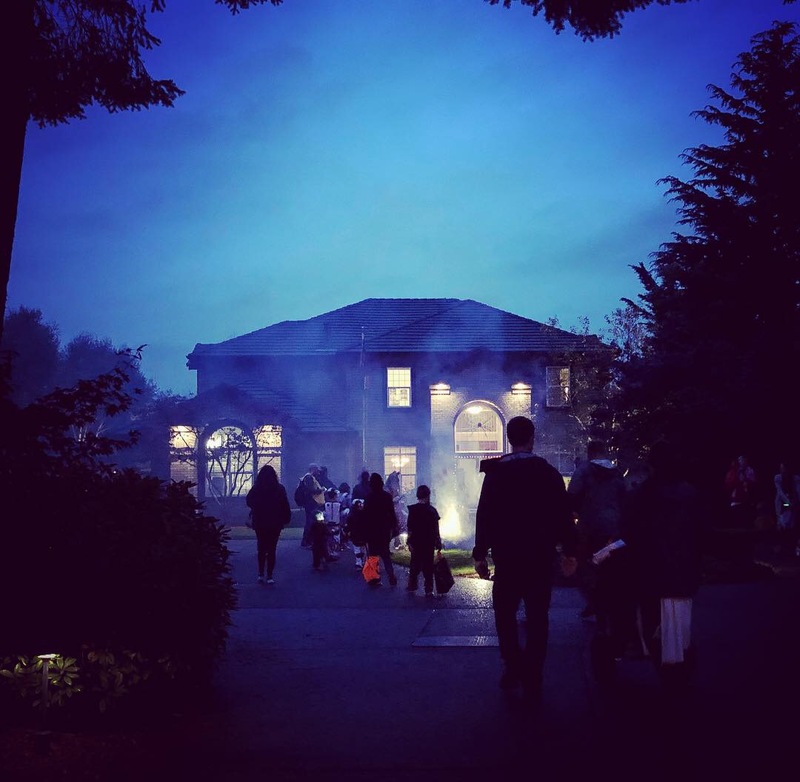 Our usual Halloween routine involves walking around our quiet neighborhood and running into a few groups of kids here and there before returning home to hand out/devour candy while watching a creepy movie of my choosing. As the resident fan of all things frightening and disturbing, I get to pick, and no, I do not limit myself to age-appropriate options, which is one of the many reasons my children will eventually need therapy. 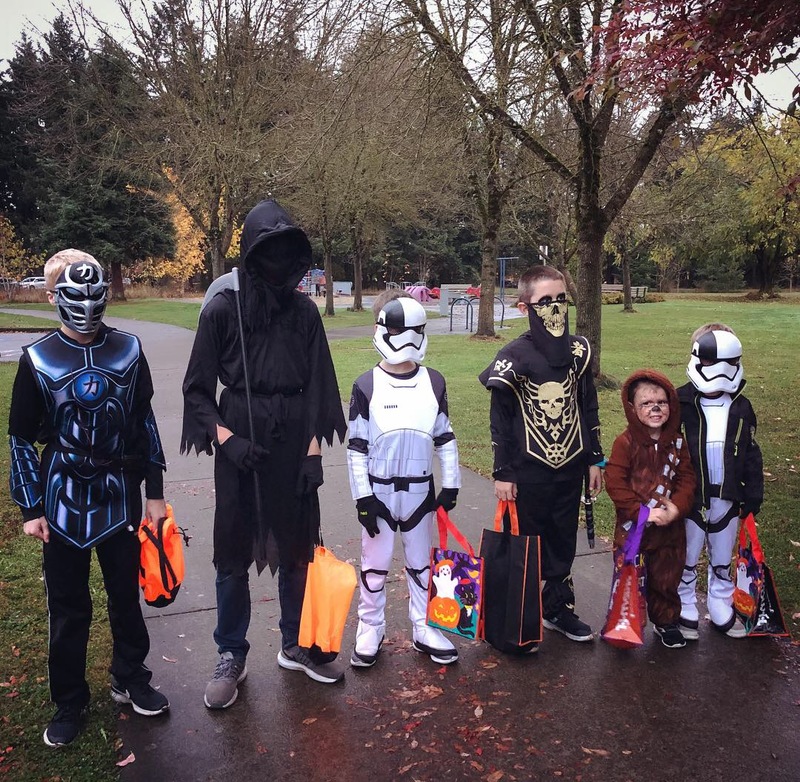 This year, however, we chose to visit John’s brother’s family so Dylan could trick-or-treat with his cousin. 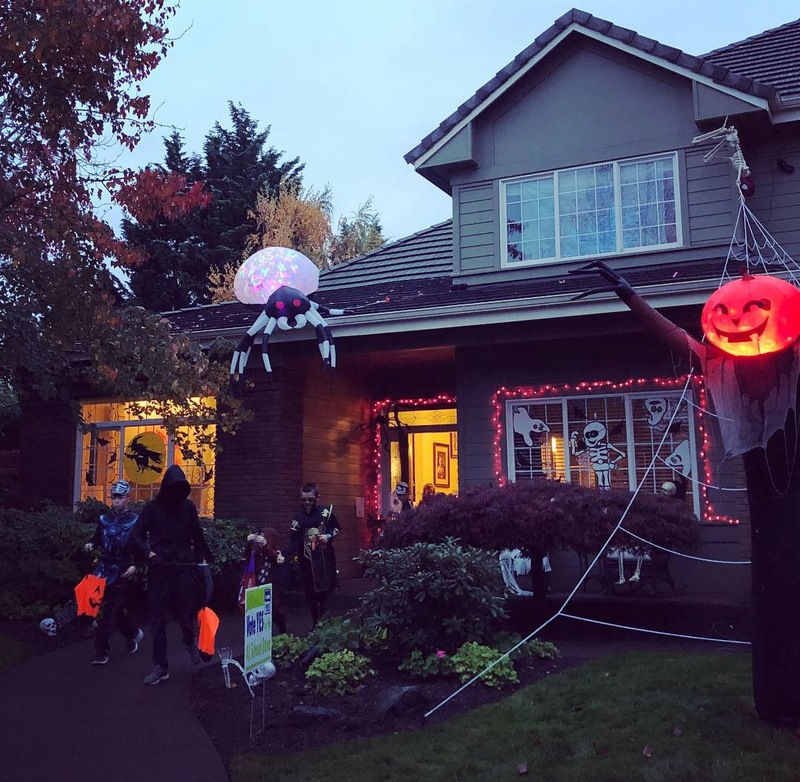 We knew their neighborhood goes all out for Christmas — they live in a relatively upscale-modest street but the adjoining streets are filled with actual mansions, and the Christmas displays are so opulent people hire limousines to go cruising by the lights during weekends in December — but we hadn’t quite realized how seriously some homeowners take Halloween, too. I have never experienced a Halloween like that. It started out pretty tame, with some cool displays here and there and a decent number of kids and families, but soon we were trekking by what felt like Hollywood sets complete with professional lighting and roiling plumes of dry-ice fog, and the sidewalks were as packed as Disneyland. It was delightful, and a little overwhelming, particularly as it got dark and the costumed crowds took on a disorienting offkey-carnival-music vibe as people loomed in and out of our increasingly tiny field of view. 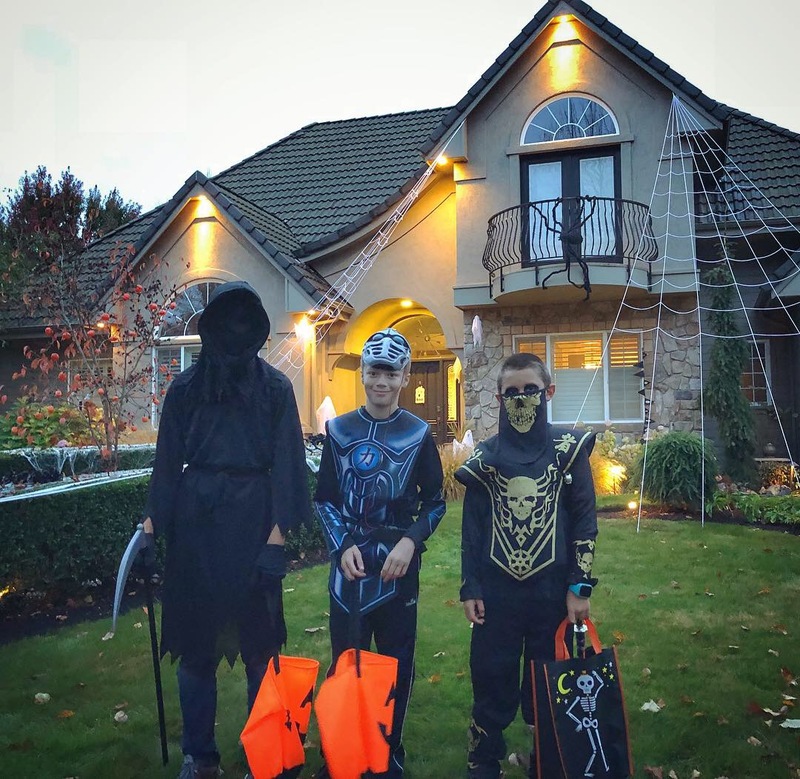 Riley was a little meh about the whole trick or treating thing and Dylan had a hard time pulling out of a funk related to getting busted for sneaking off with his cousin earlier in the evening (“But Charlie said it was okay!” “CHARLIE IS SEVEN!”) but all in all, everyone had fun. We cut out early to come home, do a quick loop to visit a few neighbors, and settle in front of the TV with our laps full of chocolate. It was the perfect mix of tried-and-true, plus something new. I have to say, our little family foursome has collectively and individually been stepping outside of our comfort zones lately — trying things we haven’t tried before, meeting new people, daring to do things that seem scary or just plain socially intimidating — and it isn’t always easy, but it’s almost always kind of great. You are spoiling us with all these blog updates…I see your website’s email in my inbox that you’ve posted and I click immediately into the article, even *before* deleting all the junk mail (now you know that is big). had. I try so hard to teach the teachable moments of gratitude, blessings, having enough, giving to others…but the age-old middle-school feelings still bubble to the surface in my sweet kiddos, as they probably do for everyone. Woowwwww. I don’t know what your costume is but the overall effect is so awesome!! 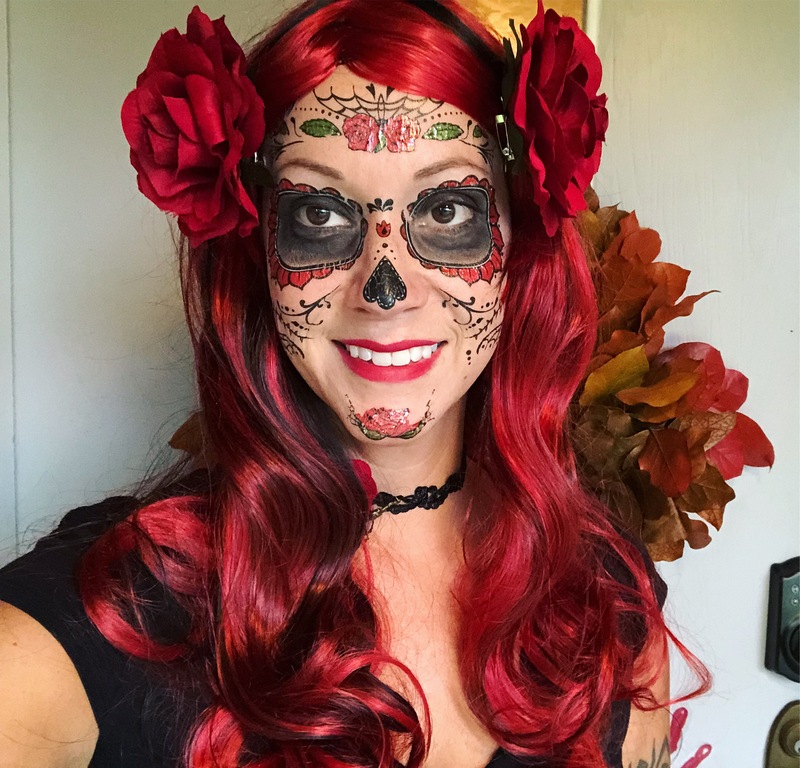 Wow – excellent costume! And the trick or treating experience sounds like a great change of pace. I love how excited some people are by Halloween — the over-the-top decorations are so fun. You’re an absolute artist with that face makeup. And breathtakingly gorgeous. If you ever decide to try a new hair color you could totally work that. We’ve been having what I refer to as a FaceBook year – I check out the local events section and start hitting “interested” on all the ones that look, well, interesting. And once I started looking up local events to go to, FB started sending me suggestions. We’ve definitely managed to hit some things I never would have known about otherwise – a night market in Chinatown, a Halloween Sober Dance Party, a Feminist Fair at a Maker Space, a Geek Festival, various craft shows and art shows… Super fun and maybe even the start of some new traditions!